In this week's challenge we'll focus on clothing storage, especially related to both kids outgrown clothes and the seasonal switch or rotation of garments twice a year. Recently we worked on organizing our master bedroom closets, and we're making this a multi-week process so you can get all the parts of this task done. That means this week we're going to focus on clothing that can be used in the future, but is not being used right now because it is either out-of-season or your child hasn't yet grown enough to fit into it. The key to storing these items is to know what you've got, and to keep it organized while you're storing it so you can find and use it again when you need it. Plus, since it's going to be fall soon, meaning the change from summer to fall and winter clothing is fast approaching, I thought the timing was perfect for this challenge. Are you new here? 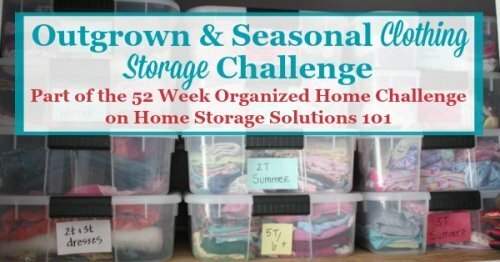 The Outgrown & Seasonal Clothing Storage Challenge is part of the 52 Weeks To An Organized Home Challenge. (Click the link to learn how to join us for free for future and past challenges if you aren't already a regular reader). During a recent challenge you decluttered your clothing in your master bedroom closet. However, if you've still got more stuff than you can easily fit in your closet don't despair. Instead, if you've got enough room in a separate area of your home for clothing storage you can separate out the out-of-season items from the in-season ones, basically doubling the space available for clothes in your closet. For example, now that it is turning cooler where I live I'm putting up my short sleeve shirts and shorts and getting back out my pants and sweaters. I'll replace lots of the contents of my closet, meaning I can have more total clothes without making everything too crowded in the process. While this storage solution has the advantage of letting you have more total wardrobe while still having plenty of space in your closet at all times, the sacrifice is that you'll need to do a switch twice a year of the seasonal clothing, in both the fall and spring as the seasons change. While you'll have to carve out a few hours of your time twice a year for this task, the time isn't wasted since you can also use it to declutter and get rid of excess items in your wardrobe you no longer want and need, and to take stock of the essentials you may need to replace. Your kids are always growing and will (it seems constantly) outgrow clothing. There is no sense having these outgrown clothes stay in circulation, having your child constantly try putting them on only to find they still don't fit, and wasting closet or drawer space. If you don't have another child who could later use the outgrown clothing go ahead and declutter outgrown items from your home, donating them to charity, giving them to a friend or family member with a smaller child, or selling or consigning them. If, on the other hand, you've got several kids there is real economic incentive to saving and handing down clothes from one child to the next. I personally do this with my two girls, and to some extent with my son (although he can't wear many of the girls things, of course) to save major cash. However, if you don't keep these outgrown clothes organized you won't find them when your next child can wear them, and there is a real danger of them outgrowing them before you come across them again. Similarly, I love to find clothes at thrift and consignment stores, or on clearance for my kids to wear. Sometimes I see items that are a great deal, but are a size or two too big right now. If I don't have these clothes organized as well, I'll completely waste my money because they'll never wear the item I spent money buying for them. The first step in the Outgrown & Seasonal Clothing Storage Challenge is to separate out all out of season and outgrown clothing from your family's wardrobe that is currently being used. You can take this opportunity to do more decluttering too, if for instance, you see an item you know you won't wear again next season, go ahead and get rid of it now and don't bother storing it. Similarly, create a small space to temporarily store outgrown kids clothes in the future, as you or your child run across something too small. This could be as simple as an extra drawer, shelf, or small box in the laundry room. 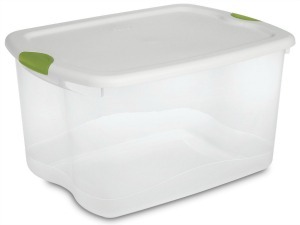 I've shown some examples of these storage containers, which I've called "too small baskets" here on the site, such as when decluttering baby stuff. If you go ahead and make a place where, as you come across clothes your kids have outgrown them, you can put them immediately, it makes the process of dealing with hand me downs much simpler. Then, you can periodically sort through the "too small basket" and get rid of things from your home you don't want to save, or place them into clothing storage in the system I'm suggesting below for the next child to use later. The second step in the Outgrown and Seasonal Clothing Storage Challenge is to create space in your home to store these clothing items you want to keep, but not to have available for wearing right now. You can keep these items in a less accessible area of your home, such as in storage tubs in a storage area, such as a less used closet, or a guest room. You can also use a wide variety of clothing storage solutions for this storage, including using extra drawers, closets, large storage tubs, or under your bed. 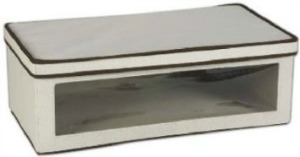 The key is to find areas which don't get damp, and preferably don't suffer from heat extremes if you can avoid them. I've written an article with the 5 rules for clothes storage that you should follow to keep the clothing you store free from damage, and looking their best, for when you want to use them again. Once you know what clothes you'll be storing, and where, take the time to get them all organized before you place them in the storage containers so you can find the ones you need easily when the time is right. First, separate each person's clothes into stacks, including separating each child's clothing out separately. Don't try to mix siblings clothes together, at least at this stage. Once you've separated out each person's clothes, again separate these piles first by season, such as winter and summer, and then by type, such as all shorts, shirts, socks, etc. together. Especially for kids stuff, make sure you also separate it out by size, so all the 4T stuff is together, and separated from the 6X items, for example. When you see an entire wardrobe laid out in this way you can really get a good sense of what you have too much of, and also what you're missing. Declutter your least favorite pieces if you've got too many of a certain item. Further, make a note of anything you notice you don't have enough of, such as t-shirts or long pants, so you can get them later. I've written an article with even more clothing storage ideas for kids hand me downs here that you can check out. 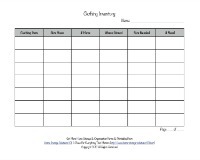 To make your notes, and also keep track of what you have in clothing storage, I suggest creating a clothing inventory. You can use the printable form I've created and shown below if you wish. You should create a separate inventory for each family member, or for a certain size of clothing, such as all size 2T outfits, for example. You don't have to list each item separately in the inventory, but instead can group things together into categories. For example, you can list that you have 9 pairs of socks but only one pair of jeans that isn't so worn out it can be passed down to the next child. The inventory lets you remember what you already have, so you don't buy stuff you already own again, and also lets you note what you still need or should replace. Then, when you see a great sale you can buy the items you need at a discount, or tell loving relatives what exact sizes and types of items your children need if they want to buy a clothing gift. If you're feeling really organized you can create a shopping list based on your clothing inventory, and look for things off-season or at the end of season to complete your next season's wardrobe or slowly accumulate any additional clothing for the next child over time. Once you've organized all the clothing and inventoried it, the final step in the Outgrown and Seasonal Clothing Storage Challenge is to add it to the storage containers or storage space you've chosen. Make sure the clothes are clean, and neatly folded so they look nice when you get them back out. Further, try to keep the organization you did in step 3 above in place as you add the clothing to the containers. Don't try to shove more than one size of clothing into a container unless you have to, and if you do have to, somehow separate out the sizes so things stay organized. For example, as my older daughter outgrew all of one size clothing I labeled the plastic tub holding all that size of clothing as follows -- "Girl, 3T." Then, when my next girl was ready to wear 3T clothing (a couple of years later) all I had to do was pull out the tub with that label and "shop" for her clothes. I examined the inventory and knew what additional items I needed to buy to complete the wardrobe and have everything a little girl wearing 3T clothes would need. That meant buying a few things, not everything entirely new, which saved loads of money! 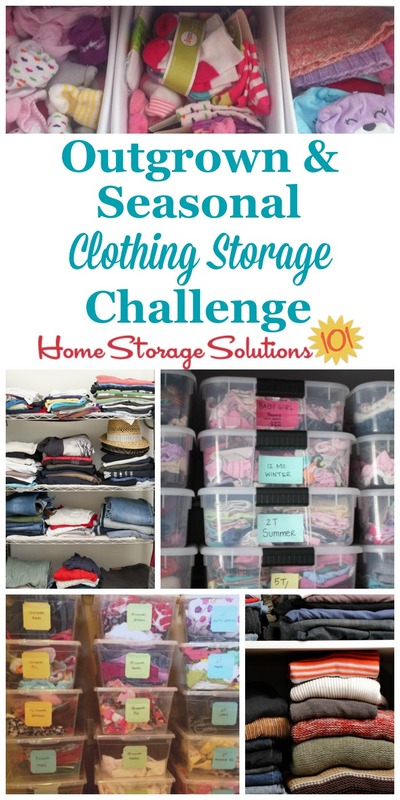 I would love to know how this week's Outgrown & Seasonal Clothing Storage Challenge is going. You can tell me your progress or give me more ideas for how you've organized these items in your home in the comments below. I also would love to see before and after pictures of your stored clothing system once you've completed the challenge. Submit your pictures (up to four per submission) and blog posts and get featured in the Creative Storage Solutions Hall of Fame. You've worked hard to get organized, so now here's your chance to show off! Further, if you get rid of a bunch of the clothing share your closet decluttering pics here in the hall of fame! 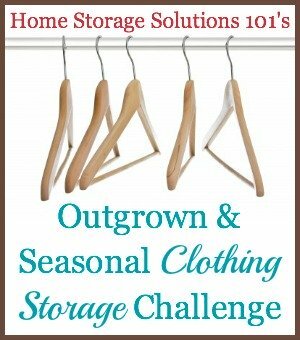 We're working on our homes slowly, one area at a time, so don't get too distracted from this week's Outgrown & Seasonal Clothing Storage Challenge. However, I know you like to know what is coming up, so I'll tell you. We're still focused on the changing of seasons, but this time by focusing on outdoor and yard organization.